The ultimate goal of an investor should be to identify and exploit attractive risk premia in capital markets. Risk premia and factor exposures have been intensively discussed in academic literature as a framework for decision-making processes in the area of Absolute Return and Hedge Fund investing. However, to practically extract a risk premium and to offer market participants an attractive investment opportunity requires a very structured approach. This article provides an insight on how to efficiently harvest the volatility risk premium in the US stock market (S&P500) through a regulated (UCITS IV) investment vehicle (OptoFlex I – ISIN: LU0834815101). We define the attractiveness of a risk premium by its magnitude, stability and liquidity. Magnitude measured as the expected return implying whether a certain risk should be considered to be taken by an investor to receive a premium. As drawdowns of an investment should be minimised, the stability of a risk premium is important as well. Sufficient trading liquidity of a risk premium is also required to provide flexibility for potential exposure adjustment in case desired. Assuming that an available risk premium combines all three of the above we expect an investor to be adequately paid for taking such a risk in capital markets. Below we demonstrate that the volatility risk premium in the US stock market (S&P500) is characterised by all three criteria defined above. The return expectation from harvesting the volatility risk premium is not only attractive in terms of the dimension, but also very stable in comparison to other capital market risk premia. Finally, the S&P500 volatility risk premium can be captured very efficiently in the most liquid derivative markets globally. An investor (hedger) purchasing an S&P500 put option is transferring the equity market risk to the seller of the put option. Subsequently the risk taker (seller of the put option) expects to be compensated through a positive expected return – the volatility risk premium – which is implied in the underlying put option. However, collecting the volatility risk premium through such a naïve way can periodically result in significant drawdowns. Hence, an investment strategy for the exploitation of the volatility risk premium is required, including a systematic approach focussing on the reduction of major drawdowns, especially negative tail risks. By capturing the volatility risk premium, the seller of a put option is facing the risk of a declining equity market and subsequently rising volatility. The buyer (hedger) of a put option on the other hand receives an insurance against the risk of a decline in the equity market. The hedger has to pay an option premium for purchasing the index put option. The price of this put option in absolute terms is comparably low to the hedger’s potential loss due to a substantial stock market decline. The hedger thereby creates an asymmetric payoff profile for himself. For the risk transfer to materialise, the put seller must be compensated with a positive expected return implied in the risk premium. Since the hedger intends to reduce his potential loss in case of a sharp equity market decline, he accepts the payment of a risk premium and receives the implied negative expected return. As the hedger consequently complies with his risk-averse nature the volatility risk premium appears. The demand for index put options is less price sensitive in market segments were many institutional hedgers are active. This is especially true for very representative markets like the S&P500. Due to their substantial market capitalisation US equity markets are representing the majority of all major market indices (the US equity market component in the MSCI World is approximately 60%).1 Therefore, if an investor has the intention to hedge his equity market exposure, an index put option on the S&P500 index is frequently used. Assuming that this price inelastic hedging demand prevails in the long run option premia of S&P500 index put options appear overpriced. As described the general risk perception of hedgers provides an indication of the magnitude for a volatility risk premium. Market participants engaged in the put market imply a higher probability of a sharp decline in the S&P500 than historically experienced. Since 1990 out-of-the-money S&P500 put options (10% out of the money) implicitly show that hedgers expect a 10% decline in the S&P500 with an average probability of 13%.2 However, the actual realisation of a 10% or even sharper drawdown in the S&P500 is only 4% for the same period. Hence, market participants are on average prepared to pay higher prices for index put options to receive insurance for an equity market decline. Let’s calculate a very simple put option price example. We compute how much a put option buyer on average is willing to pay (using implied volatility) compared to the option price assuming the historically realised volatility of the S&P500. Using the historic 10 year average for implied volatility, a 10% out-of-the-money S&P500 put option with a time to expiration of two months costs approximately USD 14.3. The price of the same option implying the realised volatility of the S&P500 over the same time period is only USD 4.1.3 Market participants are therefore willing to pay more than three times the fair option value to receive insurance against a sharp stock market decline. On the other hand market participants shorting put options are therefore collecting an attractive risk premium. The S&P500 put option market is one of the largest and most liquid option markets worldwide. On average 94.4 million S&P500 options4 were traded daily in 2015. In comparison, the average daily trading volume in EuroStoxx50 options was only 11.8 million.5 Additionally S&P500 options are essentially without counter party risk as they are traded on the CBOE exchange being cleared via the Options Clearing Corporation. Finally, a continuous trading of S&P500 options globally is practically ensured. Is the volatility risk premium stable? As indicated above the difference between implied and realised volatility for S&P500 put options can easily be calculated. 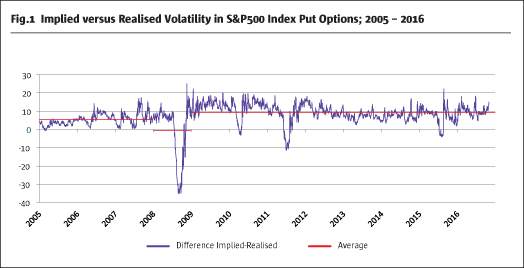 Fig.16 shows the significant positive difference between the implied and realised volatility of S&P500 put options with an average time to expiration of two months. However, this stable relationship is occasionally sharply interrupted by substantial stock market declines and volatility spikes. 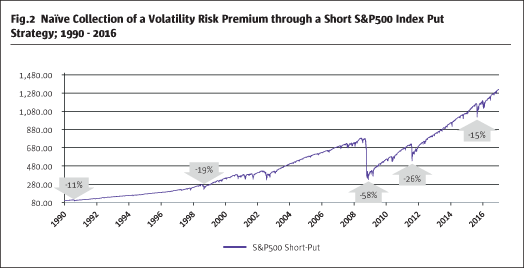 In principle the volatility risk premium is very stable. It also appears that the volatility risk premium has increased in its magnitude since the last financial crisis as proprietary trading desks of investment banks have been shut down or sharply reduced. This might be an explanation for an increase of the volatility risk premium since 2008. However, it is obvious that significant stock market declines are impacting the strategy, in particular in years like 2008 and 2011. Assuming that investors would like to reduce the level of drawdowns (risk) this naïve strategy has to be amended. As shown, the volatility risk premium fulfils three defined criteria: magnitude, liquidity and stability. However, the sudden drawdown risks associated with the naïve short put strategy cannot be predicted. Subsequently a significant reduction, especially of tail risks, is necessary to make this strategy attractive to institutional investors with limited risk budget in their allocations. This could only be achieved by a very structural amendment of the naïve short put strategy. A hedge is effective by its direct dependency with the market risk to be reduced. Any cross-asset hedges, which are based only on the historical correlation of asset classes, often do not work in periods of market stress. The underlying economic risk exposure has to be the same to ensure an effective hedge. The logical consequence is a hedging approach using the VIX index, which reflects the implied volatility in options on the S&P500, hence the same underlying. The VIX measures the implied expected future risk by market participants in the S&P500. The VIX significantly increases during times of severe market stress with a declining S&P500. Therefore a direct dependency with the S&P500 is ensured. VIX call options are used as a hedge to gain exposure to the VIX index. The options on the VIX index are highly liquid in contrast to the volatility options of other major stock markets. As Fig.38 shows, approximately 57.3 million VIX options were traded in 2015 per day. This characterises the VIX options market as one of the most liquid in the world. 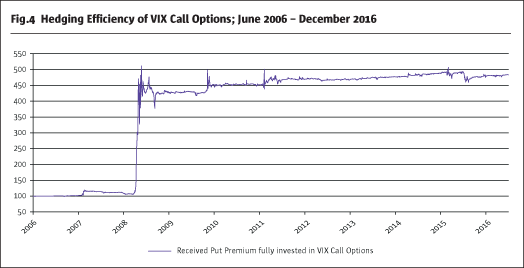 To accept a hedge as efficient, and to verify whether a VIX call is a complementary risk-reducing element in addition to a short put strategy, we look at a pay-out profile of a reinvestment of the received short put premium into VIX calls. Fig.49 shows the performance of both legs combined, in which the premium collected from selling out-of-the-money S&P500 puts is completely reinvested in VIX call options with the same expiration month. Combining both legs results in a positive performance for such a strategy. In case of a sharp and sudden increase in S&P500 volatility, VIX calls could even overcompensate the losses of being short S&P500 puts. The direct relationship of both strategy legs is obvious. Consequently, VIX Calls are a highly liquid, effective and efficient hedge to be used for a risk reduction of a short put strategy. To further reduce the implied risk of the strategy an additional long S&P500 put position is used to create a put spread. Hence a put spread and a VIX call with a very structured implementation leads to a highly attractive risk reduced strategy. Fig.510 shows that the drawdowns of a naïve short put strategy can be significantly reduced using two additional hedges (long VIX call and long put). Even an overcompensation of losses of the put spread is possible in extreme situations due to the high efficiency of VIX calls. However, it should not be expected as a base case scenario in times of severe market stress. 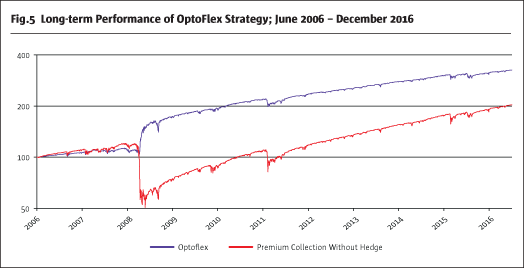 A consistent and cost efficient implementation of the described volatility arbitrage strategy is reflected in the OptoFlex strategy. Only a few regulated liquid UCITS investment vehicles are available exploiting volatility arbitrage. FERI Trust GmbH implemented this arbitrage strategy in the OptoFlex fund in December 2012. Since then the OptoFlex strategy has achieved an annualised return of 4.7% and the volatility of the fund has been 3.4%.